Integrated, turnkey systems and applications for today's agile enterprise. Whether you are an OEM, manufacturer or looking for a vision guided robotics (VGR) application, EZ Systems can help build and integrate your vision and intelligence solution. Our expertise in vision, coupled with our enterprise intelligence experience gives us a peculiar niche to provide you with algorithms and integration tools to automate and connect your systems to the enterprise. Capture data from vision and process instrumentation and collect performance information for big data analysis. We give machines vision and empower the enterprise with intelligence and integration tools. Rising global competition, quality inconsistencies and product defect liability have a huge impact on the profitability of medical device manufacturers. Medical device inspection and traceability are essential to quality and its quality management systems (QMS). Unique Device Identification (UDI) regulations are demanding better product tracking and serialization across the supply chain. EZ Systems can provide the tools and systems to identify, verify and confirm production while optimizing quality and traceability. Distribution centers are faced with growing demands to increase productivity and lower labor costs. Vision algorithms and application services play a huge role to meet these demands. Increased read rates and less false negatives are key aspects for productivity improvements. Whether it’s an automated, hand or a bulk sorting application, EZ Systems can help you implement and optimize an integrated intelligent vision solution for your sorting application. We help you leverage improved OCR and OCV technologies for package sorting, multi-side scanning, pallet scanning and print & apply verification. EZ Systems’ custom vision and software application services are just a few of the capabilities we provide to help you meet your productivity goals. Quality inspection systems in the automotive industry are critical to production. In order to reduce risk, meet compliance for regulatory demands and achieve customer quality expectations, inspections must be carried in various stages of the assembly and production process. Part inspection, assembly verification, component traceability will all significantly impact the reduction of manufacturing costs and drive process optimization. 3D vision technology used to read, identify and inspect surface depth variations ensure the best product and part is delivered to the customer consistently. Achieve high confidence in food and beverage safety with powerful vision systems and tools. Check package integrity, verify production parameters, and deliver consistent quality through advanced inspection tools and traceability. Vision systems that detect product contamination, broken seals, spillage, cap & fill level, date/lot codification, and label quality provide essential benefits to packagers and food and beverage operations. 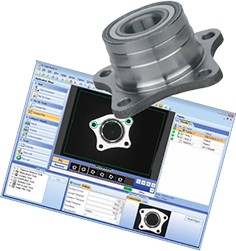 Component OEM’s and manufacturers rely on machine vision to ensure critical part dimensions are within acceptable limits. From alignment (fiducial finding) to surface-mount device (SMD) placement / guidance, identification and missing component detection, we can provide a vision solution that meets your productivity needs. Manufacturers rely on continuous process improvement to drive safety, optimize production, and reduce losses. EZ Systems provides vision solutions for identification, verification, quality and traceability. We complement our vision solutions with intelligence in the form of applications (mobile ready) and web services that provide process visibility though performance metrics (OEE) and big data analytics. Our combined solutions strategy empowers the enterprise you with actionable visibility. EZ Systems partners with educational institutions, government and businesses to drive transformational change through advance research and innovative technologies. We are developing advanced image processing systems using the latest technologies such as Neural Networks, Support Vector Machines, K-Means segmentation, and Markov modeling systems. From machine learning to adaptive signal analysis and more, we rely on the application of robust scientific knowledge and a multidisciplinary approach to build breakthrough algorithms and systems. Why Us? We understand the impact quality and performance has on business. Machine vision helps achieve consistent quality control and improved performance for a broad range of industries, reducing costs, improving productivity and ultimately ensuring a high level of customer satisfaction. Coupled with intelligence, web services, mobile tools and applications, machine vision provides a technological edge for manufacturers, supply chain distribution and the enterprise alike. EZ Systems is a vision first technology provider that builds solutions for production and enterprise integration. Our algorithms have inspected over 10 billion devices in the US and Europe. With experience like this, we guarantee value to provide sound solutions to your most challenging applications. Our ability to deploy applications and services to the plant floor and onto the enterprise gives our customers a broad spectrum of options to implement custom or off-the-shelf solutions. Need help selecting the optimal machine vision solution? Let us take a closer look at your vision application needs or simply get expert feedback on your staging and presentation challenges. We can help you find solutions for inspection, symbology recognition, guidance, identification or even quantify surface displacement measurements on components of various sizes and shapes. Send us your part or product for a complimentary analysis and consultation.